Clients at Adelante’s day programs regularly spend time learning in the community, interacting with people and important locales in New Mexico. 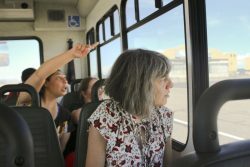 This year, people with disabilities have had the opportunity to tour the Albuquerque International Sunport, a medium hub airport that welcomes nearly 5 million passengers per year to the Land of Enchantment. 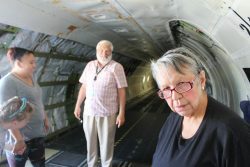 Known for its distinct New Mexican architecture and art collections, the airport is giving tours to clients around the entirety of the facility. Clients on the tour are treated to airplanes flying in the air up close! 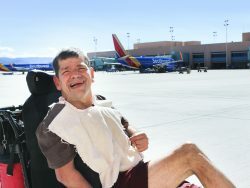 Doug Lutz, an employee at the Sunport, provides over 100 tours a year for a variety of groups. He has been offering tours for 3 years to everyone from school-aged children to retirees. College students, as well as people with disabilities are welcome to come learn about the airport on his tours. 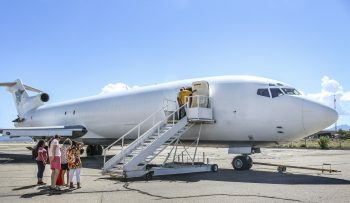 The tour starts inside the airport, but continues outside with an accessible van and the opportunity to see airplanes docking out from the airport terminal and airplanes flying onto the runways from various areas. On each tour, Doug thoroughly answers questions. Responses are always interesting – from knowing where all the snacks in passenger airplanes are stored, to seeing the old Albuquerque Municipal Airport building that was built in 1939. 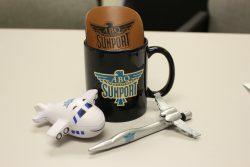 The Sunport easily creates an environment of learning for Adelante clients. 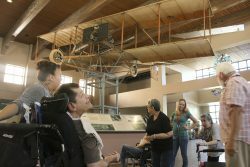 Doug Lutz (right), a Sunport tour guide, shows Adelante clients and staff the 1914 Ingram-Foster Biplane, believed to be the finest surviving example of an original Curtiss-design pusher. One highlight of the tour is getting to board a Boeing 727-200, a donated plane from FedEx that was first used as a passenger plane and retrofitted for cargo. The plane, speculated to have first started flying in the 1970’s, allows tour participants to sit in the flight deck while learning about the dials and inner workings. The Boeing 727-200 is very large. Passengers and cargo once regularly occupied the airplane space. Debbie McCracken, a program manager of Valencia County’s Community Options programs, says the airport tours have been a huge hit. She appreciates the work done by all those involved. “They [the clients] were lit up with stories of what all they were able to see and do,” said Debbie. “Doug Lutz really showed them a great time on the tour.” Clients and staff who attended the tours received gifts from Doug to take home. Participants got to sit in the pilot seat of a 727-200. Adelante would like to thank Glenna Donnell, our volunteer coordinator, for setting up the tours, Doug Lutz of the Albuquerque International Sunport for providing the tours, and Adelante day staff members for supporting the clients in their community enrichment.